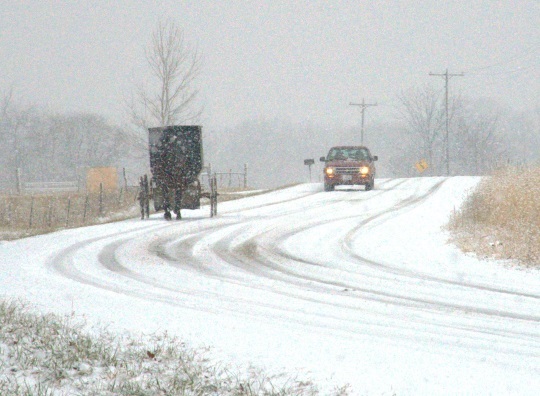 With Christmas just a week away, it’s the perfect time to look at how Amish observe the holiday. Contributor Rebecca Miller, member of an Ohio Amish church, shares with us five ways her own family celebrates Christ’s birth (the ways Amish people observe the season may vary). I have been asked this question numerous times, and as with any other aspect of Amish life, there is no cut and dried answer. But I’ll tell you, our readers, how my family celebrates. The other Thursday evening our youth group of around 70 youth gathered at a host family’s home. From there we split into 5 groups, with 4 of the groups of around 12 each going with vans, and the rest, about 20 or so, walking to a nearby nursing home. The next couple hours were spent singing for old folks, widows, and house-bound people. We had also brought grocery bags, gift baskets, and fruit trays which we handed out. Around 8:30 we were all back and enjoyed a light supper and hot drinks. After some chatting as young folks do, we headed home. If it would have been a Friday night we likely would have played games a while. Many other youth groups, besides family and church groups, go caroling too. We had ours the past Friday night. Everyone gathered at my uncle’s home where several host Moms had prepared a delicious supper of mashed potatoes, chicken, dressing, and gravy for us. The youth girls had brought in dinner rolls, salads, and desserts. After enjoying our delicious supper we sang some Christmas songs. We had a guest speaker who showed us slides and spoke of his experiences in Kenya, Africa on mission trips. It was an inspiration for us to think of those less fortunate than us. He encouraged us to be missionaries right where we are. He said that he understands most of us will never be able to go on trips like this, but we can support and pray for them. And he strongly encouraged us to let our lights shine right here at home and to notice those who need help and be there. God only needs willing hearts. Earlier this year we had fixed shoe boxes for Samaritan’s Purse. We did this instead of exchanging gifts as we usually do. We finished the evening playing games and in fellowship with each other. Pretty well every Amish school has a Christmas program. This is usually the highlight of the year for the children. There will be an hour or more of songs, poems, and a few skits the children have practiced over the past couple weeks. Though the program will have some humor in it, it will mostly be Christmas songs and Christmas-related poems and acts. There might be a nativity scene also. We want to keep with the true story of Christmas and the season of giving and joy. This is followed by gifts for the parents and the pupils’ gift exchange and very likely some candy and visiting. After an hour or so people start heading home, then the school board cleans up. Usually the teachers are given a sizable gift from the parents to show their appreciation. It is a great evening of fellowship and fun. This year our Christmas Day will be a quiet day spent at home- reading the Christmas story, singing, playing games, and of course eating all the yummy food Mom has been preparing for days. We will probably have a family night of games and snack at our house on Christmas eve. We are hosting both Dad’s and Mom’s families this year. It just came out that it was our turn to have both. Mom’s family will be here on New Year’s Day. We are having breakfast Haystack for brunch, plus other goodies. The day is usually spent visiting, singing, and playing games followed by more food in the afternoon. It’s a great way to catch up with cousins and relatives you haven’t seen in a while. We are also having a New Year’s Eve party for the unmarried cousins over 16. We’ll probably have pizza and ice-cream and then play games until midnight. Dad’s family will be here on Old Christmas. Since Old Christmas is a fast day, we likely won’t start as earlier. I believe the menu for that is mashed potatoes, chicken, dressing, salads and desserts. Each family will bring some of the food. We again end the day with more food, usually finger food goodies that are brought in. In church over Christmas we have the Christmas scriptures and sing Christmas-related songs. Another big thing for us is sending out and receiving Christmas cards and letters. We also bake a lot of Christmas goodies and fix plates to share with neighbors, the mailman, business associates, and others. Some families do family gift exchanges. This year our cousin girls exchanged names. The main focus of the season is still first of all remembering Christ – the true meaning of Christmas, family, gift-giving, and helping cheer others. I hope this will give people a look into our home for the holidays. Merry Christmas and a Blessed New Year to you all! Thank-you Rebecca and Erik for a very nice article. I enjoyed reading this. May you and all of the readers of Amish America have a very blessed and merry Christmas. Rebecca did a great job on this. I really enjoy the slices of life she shares with us. So do I, Erik. Thanks for sharing this, Rebecca. Wishing you and your family a very merry Christmas. Thank you Rebecca for sharing your holiday traditions. 🙂 It’s refreshing to hear about your community friendliness and giving spirit! It’s what Christians do, especially at this time of year. Keep up the good work! This passage is a good reminder for us all. Thanks Terry, a good reminder and one to keep in mind (even after the Christmas season is over 🙂 ). We did almost of those things when I was a kid. I was raised in the 1950’s in the farming belt of the Appalachian Mountains and we did most of those things. We did not have a youth supper and we did have a Christmas tree, usually a cedar or hemlock. On Christmas we had a holly tree. We had a gift exchange and a Christmas program at both school and church. My parents had electricity and running water in the house but both sets of grandparents, who lived nearby, did not. These wonderful Amish traditions were the norm in the not too distant past. Thanks for presenting the delightful post. I have never heard of a holly tree at Christmas, but I bet it’s a nice sight. Thank for telling us about your Christmas. I was wondering if you do any Christmas decorating in your home? Know most Amish and Old Order Mennonites don’t have Christmas trees. But I do wonder if you a nativity or any other decorating. Marilyn, You wondered about decorating our houses? I’m Amish Mennonite in KY and no community that I know of would have any decoration in or around the house. The tree, lights, and all that go with it origin from pagan traditions and we don’t like to support that. We intend to keep it simple, Christ centered. Spending a lot of money on the deco items would not be very good stewardship either, so we just focus on our Lord, giving to others and enjoying fellowship with friends and family. We also visit the local detention center in addition to places that Rebecca mentioned. We just packed and passed out 690 fried pies and devotional booklets to inmates and sang for them. That’s a highlight for them and hopefully a seed sown for the Lord. Well, you’re not missing much by not decorating the house. It’s a lot of work, but I will say I miss Dad coming home with a tree on the roof of his car. He loved the decorations – he was like a kid on Christmas. He passed away from cancer, so every time I decorate the house, I do it for him, I miss him so much. Catholics are well aware of our Pagan history. We know it bugs some people, but we embrace it as part of our history. Judith, I do know what decorating the house is like because I come from a no-God, no-church life. The Lord found me 12 years ago at age 43, divorced mother of a 6 yr. old little boy. I grew up with advent calendars and wreath in Germany and got into Santa here in the States. My son knew nothing about Jesus, just Santa and Rudolph and presents that were found under the tree. I had lights and garlands all over the place and loved it. Putting up the stuff and looking at it was always a delight but taking it down…. Guess that’s why many people have lights on the house until Easter in my area. We actually do miss the homey looks of having lights in the house/windows, but we gladly gave it up realizing that it’s not good stewardship and too “worldly”. We don’t support all the commerce anymore and we sure don’t get into debt buying expensive gifts that are outdated soon after. In my community are several converts and we usually get together on Christmas for dinner, games, visiting. It’s sad to think that many children nowadays grow up and never know what Christmas is all about, like my son would have if the Lord had not picked us up. My boy is now 18 and committed his life to God a year ago, so praise be to HIM, we are first generation Christians in our family. Have a blessed holiday! You have had an interesting life! That is really interesting that you grew up not knowing “the reason for the season” – but then found it later in life in a country far from your home. I used to live in Basel, Switzerland for about 3 years and I travelled and lived in Madrid, Spain (2 years) and Paris, France – and when I first went to Europe I couldn’t wait to worship in the big Cathedrals of history. For instance the Cathedral in Cologne, which has been the subject of literature and poetry like that of Heinrich Heine and Goethe etc. – and I went and – no one was in the Cathedrals. They were empty (except Notre Dame in Paris which is a tourist attraction more than a place of worship). I was so surprised at he lack of parishoners in Europe. In the US, most of our churches are filled (some are failing, but most have communities) – but in Europe there seems to be a distinct movement away from the Church (any Church or religion). I think after the Age of Reason, there has been a steady drop in any sort of Deo driven religion (with the exception of Islam, which is growing in Europe). I am happy for you that you and your family enjoy a commerce free Christmas. You know full well that we don’t need all this “stuff” in order to give to others. That’s totally awesome. How did you come by the Amish-Mennonite way of living at 43? If it’s too personal, I understand. I’m just curious. Several years ago a friend visited Poland and Germany. Like you she was shocked when she walked into a Polish Catholic Cathedral and the pews were empty. Then in Germany she was in a Lutheran Cathedral hoping they were better about attending worship, and the pews were just as empty! When we talked of the trip abroad, she was still in shock. We wondered why the Europeans don’t go, and us Americans do go to church on a regular basis. Our pastor at that time said that about 7% of Europe attended church. Most likely the percentage is lower today. Different polls give different numbers re: church attendance. From what I have read the Americans are more apt to go. At least they used to be! With God being removed from so much of our society, it’s no wonder. We had a Russian missionary talk in church years ago. She said looking back on the Russian atheistic lifestyle that the country had for so many years, their lives were a shambles. Nothing but failed relationships, marriages, parenting, just to name a few, were the norm. She held up the Bible and said, “Here are the instructions for a successful life!” She went on to say that to turn their country around, it was their new Christian’s who would make it happen. Trying to change elder atheists of their ways was a waste of time. Bringing the younger generation to Christ was their goal. Only then would they see a change in the Russian people! This was several years ago and was burned in my memory. Well, America needs a revival as well!!! You fill find in the Old and New Testaments many warnings to “Beware of a false profit!” Look what Hitler did to Germany! It’s is a travesty to watch what is happening in America today! Terry – I completely agree with you that religion betters an individual’s life, its benefits are substantial. From childhood education, through a person’s mental and physical health, all the way through one’s life to death, and it even helps people through the process of dying. Not to even mention the eternal benefits of the afterlife! However, religion in America has had three great revivals (called Great Awakenings) already and it’s interesting when the decline in Church attendance started to wane. Its first dip was after we introduced the words “under God” into the Pledge of Allegiance in 1954. It stayed around average for awhile and then had its biggest, most precipitous decline during the George W. Bush presidency. While Bush was President we lost all gains in attendance from the Third Awakening. And what’s interesting was although we had a spike upwards after 9-11, the trend downward kept going regardless of the “God oriented” Republican agenda. It then continued downward after Obama was elected. My gut instinct tells me (and this is just my humble opinion) – the more we cram religion down people’s throat in the United States, the more people recoil. I certainly wouldn’t say “Merry Christmas” to my Muslim or Jewish or Buddhist friends (which I’m sure you don’t either) but overall – I think the Amish have it right: don’t pledge allegiance to a flag first of all, and two – don’t evangelize unless they show interest. Let people come to their own decisions about religion, on their own. The Amish are correct, I think when they don’t shame people for not believing, but welcome them when they do. After all, the Amish were persecuted themselves for not believing in infant baptism. I think they appreciate religious freedom just as much as Muslims, Jews and other religions whose adherents have been singled out for what they believe. I don’t mind when people say Happy Holidays instead of Merry Christmas to me, it doesn’t insult me. In fact, they’re trying to be friendly, so I respond in kind. But I also agree with you in being happy that the Russian Youth are re-discovering their religion! They see the benefits for themselves and their society. Sorry in advance for the length of this message. In the 1950s, the phrase “under God” was added to the pledge, and the national motto was changed from “E Pluribus Unum” (“From Many, One” — pretty appropriate, in my humble opinion) to “In God We Trust,” because the government saw religion as one way to combat the threat of communism in the Cold War. They tied religiosity — specifically Christianity — to patriotism. It led to increased suspicion, dislike, and alienation of non-Christians. Despite the rise of tolerance and diversity in America, non-Christians still feel these effects today. We still struggle for our voices to be taken seriously, and for equal respect with Christians. Religion has benefits, it’s true. It can also be harmful, and it is not perfect. Atheism, while also not perfect, also has benefits, though many refuse to understand or acknowledge them. Atheists don’t go around evangelizing Christians (in fact, Christianity is pretty much the only evangelizing religion in the world). We aren’t trying to force anyone else to believe as we do. We just want the same courtesy and rights. As I understand it, the Amish have a history of support for separation of church and state. They were indeed persecuted in Europe because their beliefs did not match those of the state-sponsored religions. Some groups in this same situation came to America with the intention of establishing a new state that sponsored their particular religion instead (Catholics and Puritans were examples of this; in fact, they harassed and persecuted each other in their neighboring colonies in what is now Massachusetts). But other groups, including the Amish, saw the irony — they saw that goal as being no better than that of their European oppressors. They were no more interested in oppressing than being oppressed. They felt that the government should not play a role in religion, and vice versa. So it makes me sad to see people fighting to take us backward, arguing against equal freedoms being granted to non-Christians — atheists, in particular — persisting in an attitude of judgment and alienation against those who believe differently. I think a healthy dose of humility and “live and let live” attitude would serve us well. And I don’t just say that because I’m an atheist; it was my opinion even when I was a firm believer in Christianity, because I don’t support rights only for people like me, I support equal rights, even for people unlike me. That, to me, is real patriotism. Jan, with interest I read your post and I can understand to a certain extend that you don’t want to be bothered by Christians evangelizing. but that is the Great Commission and we had better spread the Gospel and make people aware that their souls are at stake. A conservative plain person or church community does not “feel” like church and state should be separated, it’s a command from the Lord Jesus. We strive to live out the Bible in every way and apply it to every day living. We are strangers and pilgrims on this earth, we are not of this world, but live in it, for a short while. Our real home is Heaven which the Lord prepared for us. We ought to abide by laws if they are not contrary to God’s word, respect authority, pray for our government. We love our enemies, therefore we don’t sue anybody and don’t take up arms to fight an enemy, we are to be non-resistant in all phases of life. If everybody on earth would abide by God’s word, there would not be wars, crime, discrimination etc. So I feel it would be a wonderful thing if this nation would go back to having God in our lives. The result of today’s crimes, immorality, divorces, abortions, etc. is a direct result of taking God out of our schools and raising our children, don’t you agree? I mean what would the morals and ethics of an unbeliever be? Everybody does whatever suits and deems right? What would the guide be for an honorable life style? Also I would like to mention that “live and let live” evidently does not apply to the Atheist society that constantly complains about something religious that supposedly bothers them. They keep the courts busy when they demand freedom/tolerance for themselves, never considering that the court system should be dealing with more important issues than whether or not there are commandments or any other Christian symbols displayed somewhere. Seems freedom goes only one way, Atheists’ way. Christians are supposed to forget about the right to honor the Lord and all that goes with it. Seems a very one sided view. This topic is a hard one to have a civil discourse on – because as my Mom used to say – it’s all fun and games until someone pokes an eye out. 🙂 To say the least – there are so many differing opinions on the topic, some black, some white and rarely any shades of gray. It can get hot real quick – but I think we’re all kind adults here. That being said – it’s good to have so many different opinions on the matter. And it’s so good to hear from a plain person’s perspective, which is why we’re here. To lift the rock and discover what’s underneath, to climb the mountain and see the view, to listen to another’s point of view and get to know another person’s heart. So Marion, when you say you don’t “feel” church and state are separate – could you maybe explain that a little more to me? I very much disagree, as I’m sure will be unsurprising. You were wrong on many counts, but I will not get into all of them. It would surely be a waste of time, and I think it goes beyond the scope of this forum. I will respond to two things you said, though. The first is the very offensive claim that atheists have no ethics. For one thing, I’m an atheist myself, and you essentially just told me I have no morals. Besides that being quite rude, it’s also quite ignorant. You don’t know me in the slightest. I am an extremely sensitive, empathic, compassionate person. For years, I volunteered at charities both Christian and secular alike. I don’t lie, cheat, or steal. I care about the suffering of others because I’m human. My empathy comes from my humanity, not from someone’s instruction. Besides that, you imply that only Christians can be good people. How arrogant and not well-thought-out such a view is. In fact, numerous studies have shown that children raised in religious environments are actually LESS altruistic, compassionate, and forgiving than children raised in humanist environments. I won’t be surprised if scientific studies mean less to you than your church’s teachings, but there’s the fact; take it or leave it as you will. I also offer another thought for consideration: we do the right thing because it’s the right thing, not to earn a reward or avoid a punishment after death. Isn’t that a more sincere reason? Perhaps you don’t agree, but I certainly feel it is sincere. And, with all due respect, we know our own hearts better than anyone else. The second point I’ll respond to is your belief that atheists are wrong to expect the Constitution to apply to them. For one thing, you said yourself that the Amish support a separation of church and state. Excuse me for saying “feel” instead of believe or support. It seems I offended you by using the wrong word, but the point is the same. If you do support that Constitutional right, then why would you get upset when atheists expect it to be upheld? Either you support it or you don’t. Supporting it only for people who happen to share your beliefs is not ACTUALLY supporting it. You imply that we are wasting the government’s time, but excuse me, I think asking them to uphold the Constitution is the furthest thing from wasting their time. I’ll close by saying thank you. You have made me that much more appreciative that the Amish I’m friends with are humble, are not judgmental, would never insult me, and have never tried to change me. Thank you for reminding me how lucky I am in having their friendship. Perhaps some of you will be happy to know you have… to put it bluntly… chased me off. I may continue to read Erik’s interesting articles, but I most certainly will not expose myself to further degradation by reading the arrogant, judgmental insults that do indeed seem to be filling the comments here. Some people complain about criticisms of Amish here. The irony is, there is even more criticism — to put it very mildly — going the other direction. If you wish to “bring people to Christ,” I can assure you that you are going about it in quite the wrong way. You’re doing the very opposite. You will probably say “good riddance,” but that only serves to prove my point. I will leave you like-minded folks to yourselves, to tell yourselves how much better you are than everyone else, and in the meantime, I’m going to go help my fellow man and try to make the only world we can be sure of a better place for -everyone-. Just as you will, perhaps, pray for me, I hope someday you too will have a change of heart. Sincerest thanks to those of you who have engaged in respectful, open discussion with me — you know who you are, and I will not forget your kindness, your true example of Christian love. Wishing everyone a merry Christmas. We may do a bit of decorating, mostly with candles and snowmen and usually some pine and red bows, but some Amish do no decorating at all. I wish more people would know why we celebrate christmas,&not worry about what you’re going to buy for this or that person, also most people have no clue why we celebrate christmas, some people think its all about giving gifts.I would be so happy just to celebrate christmas with family&friends&to have a big meal, go to church&sing songs.I have no family to do these thing’s at holiday time&I love you Amish people I learned alot f tty om you folks&I love you all.&merry christmas. celebrated Christmas in much of the same way where I grew up in the 1950’s and 60’s in rural Minnesota (non-Amish). I loved those simple Christmas programs we had at our country church where we attended and our small-town school. Very similar to yours with Christmas carols, poems and short skits. No technology was involved, not even microphones. About the only thing that was different in my area than yours was that we did not celebrate Old Christmas. We did observe Epiphany at our church on the Sunday closest to the actual date of Epiphany. I have found it interesting that in some Amish communities I have visited, all Amish stores are closed on Epiphany, certainly on Sunday, but also on weekdays if Epiphany falls on a weekday. Wow, our Christmas’ are very similar! The Youth at our church (we’re Catholic) also goes caroling to Senior Homes and then the day before Christmas the Youth and some of our parishoners are going to Tijuana to help build a home for a family with Habitat for Humanities and the Catholic Charities are readying apartments for refugees. 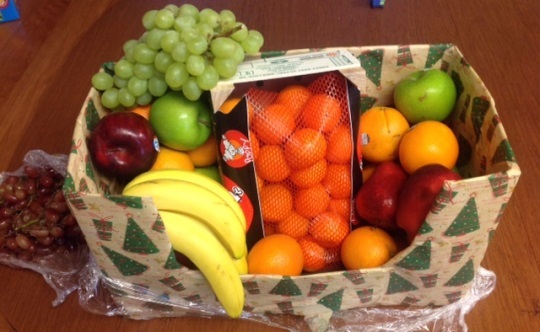 The only thing we don’t have is that glorious fruit box! Boy, that made me want to eat fruit right now! Beautiful. Then our Catholic schools also have a Christmas Program, always based on the Nativity. Then our Youth Choir sings at Christmas Eve Mass (it’s supposed to be midnight Mass but it’s always earlier than that). Then some people open their gifts on Christmas Eve, and some open them Christmas Day. I could never wait as a child for Christmas Day. We always have family together on these days. And just like you we eat a big feast on Christmas Day (if we don’t go the night before then we go on the day of Christmas to Mass early in the morning) so the time we eat varies. So it’s similar to yours – except I usually eat myself into oblivion, I have no self control around dressing/mashed potatoes and gravy. I think the main difference is after we eat on Christmas Day – then we lay around and watch football or a movie that the family loves. I think our Christmas celebrations are very similar. Similar to Jerry, I was raised in the Ozarks (not Amish)and Christmas was a very special time of the year when our Churches and our public Schools celebrated the birth of Jesus Christ, our schools put on Christmas plays, sang Christmas Carols, had small gift exchanges (maybe a couple of pencils or writing tablet. Our glee club traveled to other schools in celebration of Christmas. In those days, it seems everything revolved around the reading of the Christmas story. Hardly anyone had any money back in those days so very few kids, or people in general got big Christmas gifts. I remember one year especially, my parents had very little money for anything, but as usual they had maybe $5.00 saved up for Christmas. We had a few Apples, Oranges and Store bought Christmas Candy. That year I got a flashlight that probably cost a total of .50 cents and (2) batteries and I thought that was the best Christmas gift ever. Thank you Marion and Judith for answering my question. It was so kind of you. Thank you, Rebecca, for sharing some of your Christmas activities. I read your post just minutes after reading a letter that arrived today from our friend who is also Old Order. Your accounts of the Christmas Youth Gathering were identical! I am thinking you attended the same gathering! How fun! where I heard there will be a live manger scene.. Including a real camel and donkey inside the church.. I can’t wait! It’s a first for me..
One of the kindest Christmas jestures in my neighborhood (all Amish) is the LUG. Every year, my best friend (who is Amish) hosts a LUG filling. If you are not familiar with a LUG, it is a HUGE Rubbermaid box ( big enough for an adult to sit inside) and it gets filled with Amish necessities. Anything from food to fabric yardage, gift cards, socks, suspenders, blankets, canning jars, batteries, you name it. Many family members and/or neighbors participate in the filling up of the LUG. The host (my best friend) already knows the needy family that the LUG will go to and she may mention the needs (how many children & their ages) to those wishing to participate. Then, a night or so before Christmas, the well overflowing LUG is VERY quietly carried to the home of the family intended and left at their door. To keep it private and humble, it is left a secret. What a great idea for a community! To find a family in need and to help them out at Christmas in ways that are tangible and will effect the whole family. Generosity starts at home and that community is taking care of their own in a very wonderful way. Are you Amish as well? My kind of Christmas! Simple and meaningful. None of the hoopla the rest of the world gets involved in. I must have an Amish heart. I asked my son, Mark, how he will be spending the Christmas holidays. Some of the events will even include, me. Yesterday, Dedember 18th he was invited to some friend’s house because out of state family was coming for Christmas and Mark is friends with all of them. He went over for supper and some of the youth boys from the family spent the night at Mark’s house. Next week on Monday and Wednesday evenings, the Middle District Youth will be going Christmas caroling. They always stop by my house to sing carols for Fritzi and me. Fritzi usually joins in. (Fritzi is my three legged dachshund.}. They usually go out on a couple of horse drawn wagons and take different routes each evening. After the evening’s caroling they go to a home and have a light supper and fellowship. Ono Christmas Day Mark and I are invited to an Amish family that rae close friends of his for the day. I don’t usually stay for the whole day. I’m just not up to it,anymore. But, Mark will go separately with his horse and buggy so he can leave whenever he wants to. On New Year’s Day Mark will be going to a New Year’s dinner at an Amish home. All of the youth in the community are invitied. I know, at 63, Mark is no youth. But as he is unmarried he is still included in a lot of the youth activities and will probably go. Judith I gladly share how I got to my church community because it shows how the Lord works and makes the impossible happen, if we just listen to the still small voice. A convert lady and I had our children in public school and while waiting for the doors to open when school let out, we started talking about this or that. Eventually I found out that her outfit was Amish Mennonite. She explained to me that plain dress is modest, comfortable, still cool and what the headship covering is all about. All of it entirely foreign to me. In Germany religion is taught in school (maybe not anymore) so I knew parables, Bible characters, some Psalms but it had always been like reading a story book. This lady taught me by her life style, her attitudes, her answers to my questions that it is a guide to daily living and will get a person to Heaven, if obeyed. She invited me to church but all my life I didn’t need these hypocrites that sit in the pews and once they walk out the door they continue to break all kinds of commandments. But eventually I went with her to prayer meeting. Now, we needed a new place to stay but I could hardly afford anything and we had some pets and chickens, so it was a big problem to find something. She requested prayer for our situation in our group and as for the first time in my life somebody prayed for me (total strangers at that)I couldn’t help but cry, I was so moved. Next morning there was an ad for a little farm house in the paper that I could afford and we could bring our animals. You think I started to believe in prayer? I then went to church on Sunday with her, several weeks later, and after the service came the bishop to greet me and I couldn’t help but burst out in tears and tell him that I want that joyful facial expression that all the women have too. That I want to get rid of all the anger, bitterness and worries but that I didn’t know how. Immediately he and his wife invited us for the next evening for supper so we can have a lengthy conversation. There I sat next evening for over 3 hours pouring out my misery. There was something so genuine, trustworthy, caring, compassionate about them, it just amazed me. They listened, analyzed compassionately, pointed me to the Lord and about a months later I was born again. The ministers and the lady spent hour after hour teaching me, explaining scripture, guiding me in the new, godly way of life. I go on record with the longest instruction class in church history here. After 1 1/2 yr. of learning, working a job where I had to read and understand scripture, I was baptized into the church in May 2005. They had me start working for our then small publisher of Christian literature. They had been looking for somebody that could type and work with computer to transcribe sermons so they can be printed for those that don’t use CD or tape player (Old Order Amish, inmates), and here I was, office professional, 25 yrs. job experience, computer with correct MS office version, needing a godly job away from the “world.” The Lord had it all planned out, it just took me stepping out in faith and coming to the end of myself. We wouldn’t change a thing back to our previous life. My son is so thankful that he could attend our own church school and not having to be in public school. The discipline, curriculum, purity, games and friendships alone are priceless. I know the cathedral in Cologne, I lived about 40 min. away in the big cities in the industrial area. I also visited Paris 5 times and saw Sacre Coer and Notre Dam. Church in Germany is sort of for old people, for infant baptisms, weddings and funerals. No real teaching, Bible study, interpretation, application of Bible principles. Germans and also French are very arrogant and “can handle everything themselves” they don’t need no “imaginary friend called Jesus.” It’s very upsetting to me now. Hope this helped you a little bit. Never hesitate to approach a plain person about something or with questions, we don’t bite and gladly share our testimony, giving glory to God. That is so awesome! Thank you for sharing your beautiful life-story, you have been touched by God. Isn’t prayer an amazing gift to us? How God hears even the smallest whisper, a whimper of “help me” goes unheard. And the generosity of the first woman you met, who took you to her prayer meetings. It takes trust and love to take one in. And the goodness and wisdom of your bishop. Well all I can say is not only are you lucky to have found your new home, but your community is also lucky to have there amongst them. Thank you so much, you are an inspiration! Was it easy going from a non-plain life to a plain life for you? I know it took a year and a half of long, hard study, but the actual transition seems like it was smooth. Were there some things you didn’t miss? Some things you did miss? Were they happy for you? Your son seems to be a living testament to the good choice you made. Did he go through the transition easily as well? If you have time sometime this week to answer these questions – I would be so grateful. I hope it’s not too personal. Judith, the transition in general was very easy. I realized God is for real, He promises forgiveness of my sins, guidance by the Holy Spirit, fellowship with fellow believers, eternal life in Heaven. I knew I didn’t want to go to hell, for sure. I was eager to learn about Him. Some things changed immediately without any conscious effort of mine, like my language. There was just no bad language coming out of my mouth anymore, I felt comfortable among the church people and started trusting them. Our clothes had to change and without any asking, there were dresses and boys’ plain shirts and pants showing up for us. Everybody seemed to dig through their closets and pull out plain clothes for us. Sharing dresses with others or handing children’s clothing down to other families is a normal thing. Or ladies will be sewing dresses for other families’ girls. We sorted through my son’s toys and he had quickly picked up on war toys are not good and pulled things out. That first Christmas his teacher had put his name in for Christmas gifts from family resource center and here came the gifts. My little boy had no problem to pass on the keyboard and toy tank to community action, because “we don’t want those things.” I was in awe. The Spirit was at work! I received my first study Bible that Christmas from somebody and I cried, I was soooo touched by it. Upon changing from public school to church school, my son had a terrible time to adapt the meek, quiet spirit of the children. He wanted to fit in and belong and how do you do it in a worldly school? You show off, be funny, cut up, act like a fool to impress and draw attention. Well, he drew negative attention, because that is not how our children are raised. He had to mature and realize that right the opposite behavior will achieve what he wanted. I did read mountains of tracts on all kinds of issues and learnt a lot about our beliefs. Each question I had was answered and it was always straight from Scripture. The men folks are always there for men-wisdom, as needed. Our bishop family has a special place in their heart for us, took my boy under their wing, like their own, of course they had same age boys. He “adopted” my son for men talks or for testimony at his graduation and baptism, because my son’s father is mostly by phone only in the picture. There was no Dad or Grandpa to say anything for my boy, so the bishop took the place. We don’t have family here. My son’s relatives have not ever shown interest in him, his father is respectful of our way of living, my parents in Germany have passed away. I know other converts’ families had some struggles, but over time they have come to accept things and be respectful/supportive. Our family is the church family. For us two divorced women, Jesus and the brothers are our “husband.” We are taken care of and looked after, we seek advice for bigger decisions, things that usually a husband would do, that we have to take care of ourselves, so that is very nice and helpful. Do we miss something? No, not really. We would not mind watching some old cute movies again, but we gladly do without because we love the church and our brotherhood agreements, which are written up and unanimously adopted by all members. So if we voted for it, why would we complain about it? I still struggle with wearing dresses at times especially when I do “men” work around our little farm. Do I miss make-up, hair salon, perms, hair dye, tight pants, high heels, boom box, pop music? OH NO!! Praise God I got rid of it all!! Do I miss all the vanity of the world, the ever changing fashion? NO!!! In light of eternity, what does it matter if I wear a green, blue, black or red coat or sweater? It sure doesn’t matter. We do use electric, vehicles, phones, so there is not even a difference in those things. We don’t have TV or radio, so what? We spend a lot of time with church related things, helping others, sewing for missions, nursing home visits, work projects and a lot of fellowship. There is not even much time to be idle and that time would be spent reading etc. I know that for somebody who grew up or comes from another denomination the transition is harder than for me who didn’t have a church background. I don’t have to UN-learn anything. We have Church of Christ, Catholic, Baptist, Seventh Day Adventist background among our converts. There are former police officer, Navy vet, Army vet, Counselor, saw mill owner. In several families the women were the ones being convicted first and eventually the husbands came around too. They are true pillars in our church, maybe because us converts had the world and know it doesn’t satisfy. Only a relationship with Jesus brings true, lasting joy and satisfaction and the Spirit works everything else. Hope you can get an idea about how the transition works. I think as soon as the heart is willing to follow and serve the Lord, the Holy Spirit takes it from there and does His work in us, little by little. …I’m sorry about the Jan comment. I think that she is very sensitive. I hope things will calm down for her and she will return. That subject can get out of hand quickly, and it did. But onto this comment – your writings are amazingly interesting. That community has really pulled together for you and your son! Man, what a blessing! And wow! What an amazing description of the transition. Thank you so much for that – as well as your honesty about what you miss and don’t miss. You know, everybody misses some things and people in life. You just traded it for a great life. (I will never in my entire life miss high heels :-). I’m so happy your son has good role models. I could definitely see how starting a new plain school is different from a public school – but you’re right, we go about getting attention differently than the Amish-Mennonite. I will probably re-read your comment again tomorrow – so much interesting information that we don’t usually get! I might ask you some more questions, Marion! Thank you so much for answering my questions – and once again, I am so sure you meant no offense to Jan. I think she might have had criticism before for being Atheist and it brought back bad feelings. It’s not your fault, it’s not her fault. That topic can be touchy. God bless, thanks so much and Merry Christmas to you, your son and your community! Really enjoyed reading this… Thanks for sharing. I am very sorry Jan that you are offended by me thoughts about your post. I meant to clear up some misconception that Amish live by tradition, that a person ahs to be born Amish, that practices in every day life are based on Bible principles. Since I do not know you, I wouldn’t get the thought to be critical. The thoughts on Atheists, from my observance in my part of the country, stem from incidents around here. State and church are supposed to be separate according to Scripture, a Christian should not have part in government affairs, in general. But as you say, you do what’s right, ever wondered how do you know what’s wrong or right? To me that’s evidence that the Lord made us in His own image, with a conscience. Thus being said, if there was no God, no Creator, how would an unbeliever know what is right or wrong, what’s ethical and moral? The standard has to be set by someone. And if there is no fear in the sense of respect, for a higher Authority, then the result is human does as he/she pleases. And that, I believe, is reflected in today’s society. Mass killings=no respect and love for human life. Abortion= same thing, fornication/adultery=selfishly giving in to desires regardless of consequences for others, i.e. children involved. I condemn these sins, not the human soul. And the freedom of religion does exist in this country, but ambitious Atheists have been busy, denying any religious person, regardless of denomination, this right by demanding religious displays to be removed. Maybe you would not worry about such things being displayed, but many do, instead of “live and let live”. Anyway, I hope you accept this apology and keep enjoying this website. It is long and the comments are generally filled with strong opinions one way or the other. Some are pretty sad. Others affirm my belief in the inherent goodness of people. And some are hate-filled against Atheists. Needless to say, you and I didn’t know this existed on this site and that poor Jan had suffered a lot stressful encounters there. I think this played into her response. I hope Jan finds the strength to come back because her point of view is just as valid and important as anybody else’s here. That topic is an extremely difficult subject to navigate online. People can not see each other’s eyes – and thus can really hurt each other immeasurably without knowing it by their choice of words. That thread also has many positive aspects to it as well and you might find it interesting. Thanks again Marion, for you unique perspective. I also hope that Jan knows that I think Marion’s comments come from a place of love. I know that when the Jehovah Witnesses come to my door, I don’t slam it in their faces because I honestly believe (or want to believe) that they are really trying to help me. That deep in their hearts they feel I need help and even though I don’t need their help from my perspective – I appreciate them caring enough to try to help me. (If that makes any sense at all). One afternoon at a birthday party, my dear friend Rachel (who is Amish) told me … “You know… When we die and go to Heaven, God is not going to ask us which church we went to.” And I believe Rachel summed it up in that one sentence of how most Amish believe. God will already know which church we went to, and as Rachel’s comment so beautifully stated, it’s not the important consideration. Knowing Jesus, living as He would have us live, and giving glory to God is what truly matters. If you don’t know Jesus as your Lord and Savior, we are in the “age of grace” in which it is possible to ask Him to come into our hearts. No one knows when the world will end. For many people, that day could be today, as no one knows the time in which they will leave this life. Why wait? He came in “the fullness of time,” and no one ever opened his arms wider than Jesus, when His arms were outstretched on the cross for your sins and mine! Friends, if you don’t know Him, it’s simple: ask Him to come into your heart today. Why wait?!! I really like the way you worded that, James! I totally agree with Rachel! In Rebecca’s family, I’m curious, what is the style of wrapping paper used? Solid colors, cartoon designs of festive creatures? Santa? I assume/guess some Amish families would object to Santa oriented wrap.. I am feeling rather pleased with myself, I just made homemade Christmas cards for a couple of people I know. We usually go for wrap with snowmen, snowflakes, nativity, or patterns and stripes. No Santa or cartoon characters. And thanks, everyone for the kind comments. Hope you all had a Merry Christmas ! Ah, thank you, Amish Girl – Rebecca, for the reply! I’ve not seen much nativitiy prints in local stores much in my area. Rebecca, in your area, did you folks get a ‘white Christmas”, in my area in Ontario, Canada, we were treated to a green Christmas with some rain on the day, it wasn’t until December 28 that we got a major dose of snow activity. A joyous Christmas wished to all. It was so nice to read of simpler, Christ first and family-centered festivities. That is the best way to celebrate His birth, I believe. Everyone has to come to their own conclusions about Christmas decorations. The story I got about the Christmas tree dates to Martin Luther, who apparently was out walking one evening. He looked up at the sky, saw how the stars shone brightly on that clear, winter night in his native Thuringia, Germany. When he tried to describe it to the children, giving glory to the Creator of All Things, as we know our God and Lord to be, he took a small fir tree, wired on some candles, and voilà, the first Christmas tree! The children were who hung the nuts and apples, etc. on the branches, being taught that all good and perfect gifts come from the Father. It was by the way Luther, who started the tradition in Germany of Das Christkind bringing the gifts, instead of St. Nicholaus. St. Nicholaus, the Bishop of Myra many years ago, was given December 6th as his day. In Bavaria and Austria, the diminutive ending is added to Christkind (Christ-child), making it “Christkindl”. It takes little imagination to realize how that was corrupted into “Chris Kringle” in the USA thanks to a linguistic twist. Clement Moore’s “A Visit from St. Nicholas” combined with the idea of Christkindl bringing gifts at a time when speaking anything but English was the rule created the custom of St. Nicholas aka Santa Claus (Sinterklaas in Holland—you can again see the linguistic turn that would bring about Santa Claus!). We know the source of all good and perfect gifts. Gift-giving has gotten out of hand both here and in Europe. Weihnachten in German is a derivative of two words: Weihe=an ancient word for holy, and the old plural of Nacht=nights. Holy nights is the literal, and in Europe, it is not just December 25th. December 25th is only day 1, and day 12 is January 5th. “Old Christmas” or Epiphany, is the ancient feast of the Incarnation, which is older than the 4th Century pope’s declaration of December 25th as Christmas. Therefore, in many parts of Europe, especially England and Germany, it’s a longer festival than what is common in America. How very disconcerting it was to go to stores on 12/28/2015 and find employees already clearing shelves of the former “After Christmas discounts”! This year they already put out the St. Valentine (another old Roman Catholic Saint) items and cards! All that pink just after the beautiful red and green was rather jarring! By the way, and “you can verify it on google,” to quote from a line in a movie (in which the uncle, played by Jeremy Irons speaks with a sort of Georgia accent! ): St. Valentine was a martyr. They say that gazing on the relic (his skull, apparently housed in Rome) of St. Valentine has the peculiar effect that one cannot frown for the rest of the day! So goes the story. However you are celebrating these beautiful days, make Jesus the center, not Fables or Saints, and you will honor the Lord. I like folk tales, fables etc., however, they have their place. Those who would place them ahead of our Lord do a serious wrong, and the simpler the celebration, the better, I feel. (A merry Christmas, a blessed, healthy new year, and all that is good for body and soul)! Yes, now in modern times, Jesus is the reason for the season. But even us Catholics know that the date of December 25th has pagan history and that we appropriated that date, or “Christianized” it. Catholics don’t allow Christmas decorations (a much broken rule) or Christmas carols to be sung in Church until Advent is done. I actually love advent carols, and I love the advent colors of purple (and pink for Gaudete Sunday). Advent makes Christmas all the more special. It’s all about “waiting” and waiting makes the thing waiting for all the more sweet. And we also celebrate Christmas all the way until the Epiphany, singing Christmas carols and keep our decorations up until then. I think the absence of Advent in secular society bothers me more than the post Christmas take down of decorations. I kind of get bothered by the Christmas hype after Thanksgiving. Advent and Lent are my favorite seasons of the Church calendar, even more so than Christmas (though Easter is definitely my favorite Feast and the Highest point of the Church year). I love Christmas, don’t get me wrong, it’s just when I was a child it was numero uno in my book – and now that I’m an adult, I realize the Christian meaning of my immortal life is the Paschal Triduum. whole focus for Christmas, as He is to be every day of our lives. Your article is very helpful! I have been enjoying reading about the Amish community. My husband recently started working for an Amish cabinet company. There are only a few non-Amish men who work there (my husband is one). Today we were invited to the company Christmas party this Thursday. 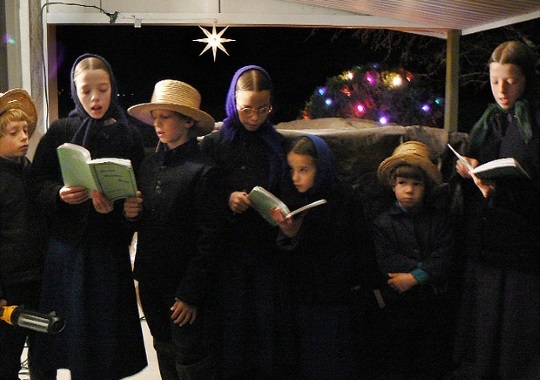 What is the etticate for attire of non-Amish women and children at an Amish Christmas party? Should we bring something (food, gift, etc)? Any advice would be appreciated. Thank you very much! As if Amish food couldn’t get any better, a Christmas meal sounds amazing!!!!! My wife and I had a HUGE Amish meal one time. It was one of those times we honestly came back to our room and could hardly get off the bed. We felt like we had just gained 10 pounds each. Ohhhhh, it was delicious! Great, now that I’m thinking about food I need to go over to Rise’n Roll Bakery in Middlebury and get some donuts! these or use “graven” images. That would be idolatry. One Whom He sent, the Word made flesh to dwell among us.